It’s Election Day. Here’s what you need to know about Maine’s biggest races. Good Election Day morning from Augusta. Maine’s 2nd Congressional District could be a fulcrum for partisan control of the U.S. House of Representatives — though ranked-choice voting could delay the result — and voters will decide who will hold the keys to power in Augusta. Candidates were stumping for last-minute votes during the weekend and Maine’s two biggest election are highly uncertain. 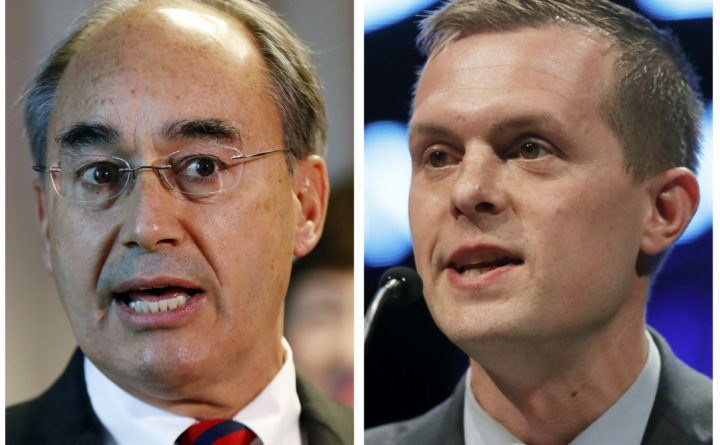 U.S. Rep. Bruce Poliquin, a two-term Republican, and Assistant Maine House Majority Leader Jared Golden, a Democrat, have been virtually tied in recent polls and public polling has been scarce in the toss-up governor’s race. There are many more key issues on the ballot as well, with all of Maine’s 186 legislative seats up for grabs with close divisions in each chamber. The state could pass a controversial universal home care program and two congressional incumbents face three-way races for new terms. Lots of people are looking at Maine’s 2nd District as a national bellwether for control of the U.S. House of Representatives. The biggest prize in the 2018 election is the House, which Republicans have controlled since 2010. Democrats are favored to take it back in a midterm year for President Donald Trump, while Republicans will likely hold the Senate. Maine’s 2nd District is seen as a fulcrum. It went for Trump by 10 percentage points in 2016 in a historic split of Maine, but Poliquin faces a tough matchup with Golden, a Marine veteran who outraised the incumbent behind a wave of individual donors. If the incumbent hangs on, Republicans may stem the bleeding. A Golden win could portend a solid Democratic year. Between campaigns and outside money, more than $20 million has been spent on the race, according to the Center for Responsive Politics. The Wesleyan Media Project said the 2nd District saw 6,300 TV ads over a nine-day stretch in October — more than any other House race. Golden has seized largely on Poliquin’s vote for the Republican plan to replace the Affordable Care Act, while the Republican has fired back by comparing his A rating with the National Rifle Association to Golden’s D rating in a district that sank a 2016 gun control referendum. Ranked-choice voting will be in play for congressional races. If neither Poliquin or Golden make it to a majority in the first round of tallying, voters who pick longshot independents Tiffany Bond and Will Hoar could come into play. Ranked-choice tallies won’t be released until next week. It’s hard to tell where the governor’s race stands going into Election Day. We had a pretty good idea that Gov. Paul LePage was at least favored to win at this time in 2010 and 2014, though polls overestimated his lead in the first election and underestimated it in the second. However, we have nowhere near the level of confidence about this election in 2018. All indications are that it is a two-person race between Attorney General Janet Mills, a Democrat, and Republican businessman Shawn Moody. Mills led in the most recent public poll in the race at October’s end, but there have only been three public polls since August. After the last poll, Mills said her polling indicates “a dead heat” with Moody. The Republican told a reporter on Sunday in Augusta that he feels “the same grassroots support” that led him to a surprisingly dominant victory in the June primary for his party’s gubernatorial nomination. While State Treasurer Terry Hayes, an independent, is a longshot to win, her vote total is worth watching in the plurality race. She hasn’t cracked double-digits in any public poll, but Republicans have tried to boost her with liberals in mailers and ads in a bankshot bid to defeat Mills. Democrats have long called for her to leave the race. Legislative races and Question 1 on the ballot are also uncertain, while two congressional incumbents and bond questions are favored to win. Yesterday, we said that control of the Maine Senate is a toss-up, while Democrats are probably favored to keep control of the House of Representatives. The biggest races fall into three main categories — perennial swing seats and potential Democratic pick-ups in southern Maine and Republican pick-ups in rural areas. Mainers will also vote on Question 1, a referendum for a universal home care program to be funded a new tax on income and wages above $128,400. It is proposed by the Maine People’s Alliance, and the tax scheme has drawn most of the opposition from business groups and politicians of all stripes. It led in an August poll, though it indicated potentially soft support. Independent U.S. Sen. Angus King is favored to win a second and likely final term over state Sen. Eric Brakey, R-Auburn, and Democrat Zak Ringelstein. U.S. Rep. Chellie Pingree, a Democrat from Maine’s 1st District, is likely to fend off a ranked-choice voting challenge from state Rep. Marty Grohman, I-Biddeford, and Republican Mark Holbrook, though the race could heat up if Grohman can overtake Holbrook in the first round of voting. Very little opposition has emerged for four bond questions, which propose borrowing for upgrades to transportation and water treatment systems, as well as projects on university system and community college campuses. In all, the four questions ask Mainers to borrow an additional $200 million, which will trigger matching funds from other sources. By the time you read this, polls will be open throughout Maine. They must open by 8 a.m. and close at 8 p.m. Soon after that, results from the state’s more than 580 precincts will begin pouring in to be tabulated by the BDN’s well-oiled election night team. Secretary of State Matt Dunlap is expecting 65 percent turnout, high for a non-presidential year election. Track all the results by clicking here. Need a ride to the polls? Click here to find out how to get one in the Bangor area. Click here for information about free rides in Greater Portland. If you are still unclear on what awaits you on the ballot, click here. To read about how the candidates for Maine Senate stand on key issues, click here. For Maine House candidates’ responses to the same questions, click here. And to track all the money outside groups are spending to influence this year’s Maine elections, click here. If you still have questions about the voting process, click here, then click on the green bubble at the right and someone from the BDN will help you find answers. Three different Maine groups have active citizen initiative petitions, including one for a new paid sick leave referendum from the Maine People’s Alliance. Mainers can expect representatives of those groups to be at polling places, soliciting some of the more than 61,000 signatures needed to get their petitions on a future ballot. The most notable one is from the Maine People’s Alliance, which was just allowed to begin collecting signatures for a referendum to create a statewide paid sick leave program. The bill require Maine employers to provide eligible employees with earned paid sick leave at a rate of at least one hour for every 30 hours worked and allow employees to use 40 hours per year. Many of you will also see petitioners for two other referendum efforts targeted at the 2019 ballot — those to allow physicians to help terminally ill people end their lives in Maine and to pass a state law banning female genital mutilation. The human rights violation is a cultural practice in African and Middle Eastern countries and it is already federally illegal. — The governor plans to move to Florida when his term ends. Maine Public reports that during a rally for Republicans outside the State House on Monday, LePage reiterated that he would take up permanent residence in Florida and perhaps teach at an undisclosed location there. He told WVOM this morning that he would be interested in teaching finance or presidential history. The governor and his wife, Ann LePage, have long owned property in Florida, and earlier this year they sold a home they had bought in Boothbay. LePage said he would move regardless of whom Mainers elect to succeed him because the tax landscape is better in the Sunshine State. — Bangor is studying the feasibility of installing solar arrays on city property. City councilors on Monday agreed to spend $8,600 to study how much it would cost the city to build and operate solar arrays on municipal properties, as well as what energy savings would come from those investments. The city will pay for the 19-day study with funds that it had already budgeted for an audit of its energy supply. — Congress isn’t working the way this nation’s founders expected it would. A lengthy analysis by ProPublica and the Washington Post examines how the legislative branch has veered off course from what was envisioned by those who wrote the Constitution. After more than 200 years of crafting compromise legislation and serving as a check on the executive branch, Congress has morphed into a weakened legislative branch in which debate is strictly curtailed, party leaders dictate the agenda, most elected representatives rarely get a say and government shutdowns are a regular threat due to chronic failures to agree on budgets. The changes have given partisan leaders far more power than they ever wielded and essentially shelved meaningful committee work and blocked newer members from playing significant roles in the legislative process. — Wondering how we got to this point? So are we. But Alexis de Tocqueville offered a pretty good analysis of how it all started with his seminal and much studied “Democracy in America,” first published in 1835. Click here to read the first book of that treatise on democratic revolution if you are feeling nostalgic or need to kill some time in a polling place line. So we’re going to make this quick and easy. — Soundtrack Candidate A represents the educational rap party. — Soundtrack Candidate B represents the early childhood youth in motion party. — Soundtrack Candidate D represents the “Why the empire fell” party. — Soundtrack Candidate E represents the kinder, gentler days of yore party. There will be no ranked choices. Vote for one, Vote for them all. Tap the candidate that makes you tap your feet. Vote for anything that adds a little joy and harmony to your day.